Pregnancy update: I’m in my 12th week now and my belly is starting to grow. I still can’t believe it but look how huge it is now. Still not wearing maternity clothes but I bought a number of tights already. I feel more energized this week. At least the “all-day-sickness” was reduced a bit. The only worry I have right now is having stretchmarks. A few days after I discovered this great news, my niece told me to start applying shea butter or any creams which contains Vitamin E on my belly to improve my skin’s elasticity – thus, preparing it for its rapid expansion. It has been said that keeping your skin well-moisturized beginning in the first trimester may help prevent stretch marks. 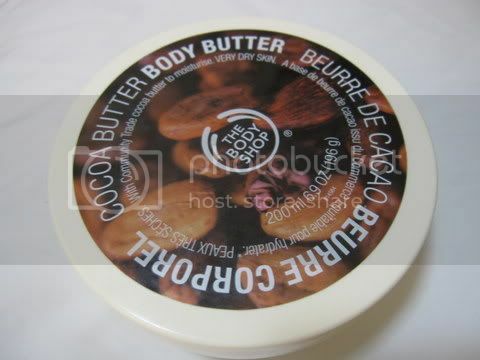 The first product I’ve tried is Body Shop’s Cocoa Body Butter. Product Description: Doubly rich for extra dry skin with a yummy chocolate-and-vanilla scent. An excellent moisturizer that melts at body temperature, leaving the skin feeling soft and silky smooth. The product is thick and creamy. A little goes a long way. Keeps my skin moisturized which lasts for hours. I apply it day and night. Leaves my skin soft once it is absorbed by the skin. The smell is a bit strong for me. My nose is a bit sensitive lately and I go prefer light scents. But I’ll keep using this till I finish it. Will I buy this again? I can’t say yet if it really prevents stretch marks but I’ll update you guys soon. But so far, this product gives promising results. The only con for me is the smell so I might try the Body Shop’s Shea Butter next time. Hi sis! I used to apply that on my whole body when I was pregnant and yes, I also used to slather it on my tummy. I also didn't like its scent when I was pregnant, blame it on pregnancy hormones. Hehe. If you want a better product to put on your tummy, try Palmer's Body Butter for Stretch marks. That was what I used before after observing that the Cocoa Body butter from The Body Shop isn't enough to prevent stretch marks. 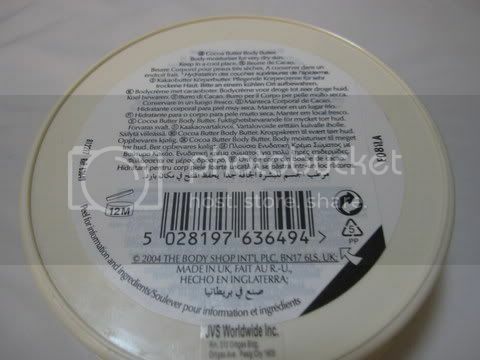 By the way, the one from Palmer's doesn't have an overpowering scent like that of The Body Shop's. 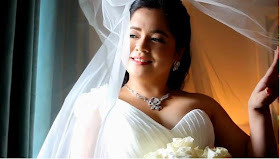 wow you're pregnant na rin pala! well i'm nearing may 5th month and i'm using my lola's DELON + Intense Moisturizing coconut body butter.. i'm prone to stretchmarks kasi, i think it's in my genes..